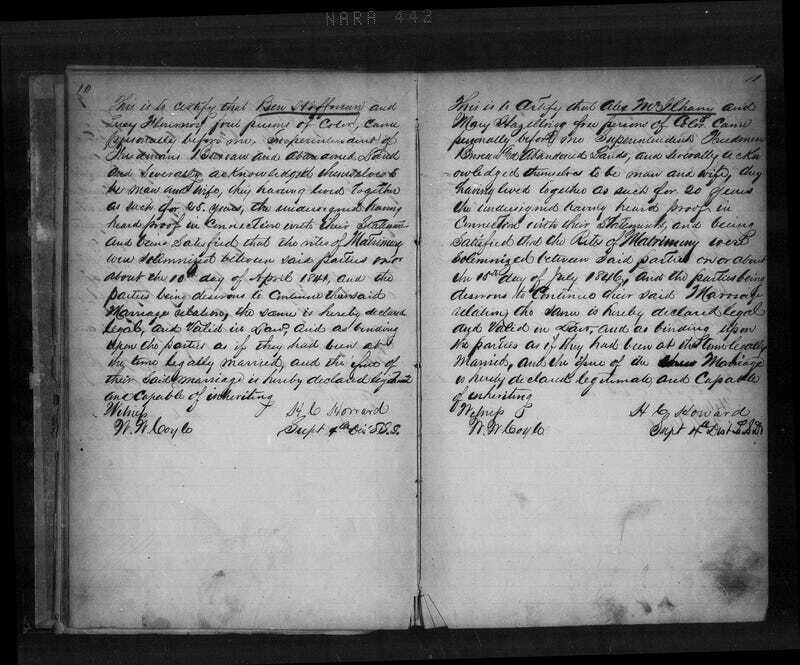 Do Freedmen’s Bureau Records Show the Marriage of My Kin? On the death certificate of one of their daughters, Francis Hoffman Trumbo, Lucy Hoffman is recorded as “Lucy Gassett,” the name that came down to me through oral history from my grandmother (Anna Brooks Hawkins Murphy, born between 1884 and 1888). I am not sure why Lucy Hoffman is also recorded in census documents as Lucy Gassett. What you have found is special documentation indeed. As Professor Gates wrote in a previous column, a wealth of information on newly emancipated black people was kept by the federal government during the years immediately following the Civil War by the Bureau of Refugees, Freedmen and Abandoned Lands (also known as the Freedmen’s Bureau). “In March 1865 … [the bureau] was established in the War Department to provide aid to thousands of emancipated slaves and poor whites living in the South and the District of Columbia. Between the years 1865 and 1872, the Freedmen’s Bureau kept track of a variety of records, including marriage, medical, school and census information,” he explained. Before emancipation, marriage between enslaved persons had no legal standing or protection. Spouses could be separated or sold off at will by their slave owners. The National Humanities Center has an excellent description of how slavery affected couples and families that may help you understand more about the conditions under which your great-great-grandparents lived. Naturally, many African-American couples wanted to have their informal marriages during slavery documented once it was legal to do so. The Freedmen’s Bureau marriage records are held by the National Archives, as are the agency’s other records. So, congratulations! Based on the information that you submitted, it seems very likely that the Lucy Flensnoy in the marriage record is the same person as Lucy Hoffman in the census records, particularly because of the low number of marriages recorded in Mount Sterling by the Freedmen’s Bureau. According to the marriage record, Ben and Lucy had been living together as a married couple for 25 years, and their union took place on or around April 10, 1841. That would place this record documenting the marriage at about 1866. Since we know that your Hoffman family were living in Mount Sterling, Montgomery County, Ky., it is very likely that this record is for the same couple that appears in the census, since the records are so close in date. What’s in a Name (or so Many of Them)? As you mentioned, Ben and Lucy Hoffman were residing in Mount Sterling, Montgomery County, Ky., in 1870, and in 1880, Lucy Hoffman was residing there as a widow. In both records, the Hoffmans are residing with members of the Brooks family. You may want to investigate them further to see information on their family if you hit a wall researching members of the Hoffman family. We first wanted to focus on trying to learn more about the Flensnoy and Gassett connections to the Hoffman family. It is good to collect as much information as you can about your family and their associates to use to compare with other records to determine if you have found a likely record for your family. You mentioned that the death record for their daughter, Francis Hoffman Trumbo, records her mother’s name as Lucy Gassett. According to the death record for Mrs. Wm. Francis Tomibe (spellings are sometimes wrong in transcribed records, but you can find the original record available at Ancestry.com, subscription required), Francis was born in Bath County, Ky., about 1849. The record also states that her father was Ben Darsie born in Virginia and Lucy Gassett born in Georgia. This adds yet another surname to investigate to determine why neither parent’s surname was recorded on her death record as Hoffman. It also suggests that the family has ties to Bath County, Ky., in addition to Mount Sterling. Additionally, we located the death record of another daughter, Lucinda Sanders, on March 10, 1921, which records her mother’s name as Lucy Gossett. A closer look at Lucinda Sanders’ death record (the original record is available on Ancestry.com) indicated that Lucinda Sanders was born about 1839, since she was 82 years old at the time of her death. It also states that her father, Ben Hoffman, was born in Virginia and her mother, Lucy Gossett, was born in Georgia, which matches the birthplace information you found in census records. Lucy’s surname is a close match to Gassett, and since this was the surname that you state had been passed down through the generations, it appears that this was likely Lucy’s preferred surname. So why, then, did her marriage record state a different name? Surnames for former slaves following emancipation could be very fluid across records. Sometimes, former slaves were given or adopted the name from a former slave owner. It is not unusual for early records following emancipation to reflect the slave owner’s surname and for the individual to later adopt a chosen surname in rejection of his or her former owner. This could be the case with your Lucy Flensnoy/Gassett/Gossett/Hoffman. Perhaps Flensnoy was the surname of her former owner that was used on her marriage record but she later identified as Gassett/Gossett as her chosen name. However, sometimes even these chosen names came from a slave owner prior to the last slave owner before emancipation. Since you are not sure which of these may be the case, you will likely benefit from seeing what slave owners were in the region with the surnames Hoffman, Gassett/Gossett and Flensnoy to see if any of them had slaves in their households who would match the description of your Lucy and Ben Hoffman and their children. With this in mind, we looked at the 1860 U.S. Slave Schedules (via Ancestry.com) to see if there were any slave owners with these surnames living in and around Montgomery County, Ky. In 1860 a slave owner by the name of William Hoffman owned four slaves in Mount Sterling: a 30-year-old male, a 20-year-old female, a 2-year-old female and a 6-month-old male. These individuals are not a match for what we know about your Hoffman family, but it demonstrates that there was a slave owner with that surname in the same town where Ben Hoffman and his family settled following the emancipation. Keep in mind when you are searching records that the unique-sounding name “Flensnoy” could be transcribed incorrectly, so you will want to pay attention to variations of the name. The only slave owner we were able to locate with a name similar to Flensnoy was a Benjamin Flenury, who owned four slaves in Shelby County, Tenn., in 1860. Based on the ages of the slaves in his household, he does not seem to be a likely fit for what is known about your family. A better possible fit may be Michael Flannery of Garrard County, Ky., who had a 54-year-old female slave recorded in his household in 1860 that could be your Lucy. Garrard County is just two counties away from Montgomery County. Interestingly, we were not able to locate Michael Flannery in the 1860 census, suggesting that he may have owned slaves in Garrard County but he did not live there himself. There were, however, a number of individuals with the surname Flannery living across the state of Kentucky in and around 1860. Some of these individuals were born in Virginia, which may be a connection to Ben Hoffman’s birthplace. Interestingly, there were three slave owners with the surname Gassett residing in Bath County, Ky., in 1860. Montgomery County shares a border with Bath County. This is also the same county the death record for Ben and Lucy Hoffman’s daughter Francis indicates she was born. One household, that of a Mathias Gassett, had a 51-year-old female and two 48-year-old males recorded in the household, all around the same age as your Ben Hoffman and Lucy Gassett/Flensnoy. We located the same man recorded as Matthies Gosett residing in Bath County in the 1860 federal census, which records his birth about 1797 and his occupation as a minister. According to his gravestone, the Rev. Matthias Gossett was born May 6, 1792, and died Dec. 23, 1874. With this information, we located him in 1870 residing in Mount Sterling. Mathias Gossett (recorded as “Gopet” due to the “p” being a symbol for a double “s”) owned slaves in 1850 in Bath County, Ky.; that also could match the descriptions of your Ben and Lucy Hoffman. It seems a good possibility that your Ben and Lucy Hoffman may have been connected to the Rev. Mathias Gossett of Bath and Montgomery counties in Kentucky. It would likely be worth investigating him further to see if you can find any property transactions between him and anyone with the Flannery surname or a variation thereof. It could be that the early marriage record for Lucy recorded a surname that she used during her enslavement, but that she then chose to adopt the Gassett/Gossett name after that. Researching more into the white Gossett family may reveal more clues about Hoffman ancestors.